Mattresses sure aren’t what they used to be. Believe it or not, there was a time when you had to buy a mattress and a box spring from a store and have them delivered. But, no more. Zinus is a leading pioneer in the industry and has elevated mattresses to the next level. We researched and put together Zinus mattress reviews to so you can find the right fit for you. Before we jump in, here are some features to keep in mind. Sizes Range - Most of these come in a full range of sizes from narrow twin to California king. Some of the more specialized ones come in more limited sizes. One more thing? You should also keep the mattress height in mind. Firmness - Memory foam mattresses are, for the most part, medium to firm. There are a lot of other options, though, including hybrids and folding mattresses with different densities. It’s really all about personal preference. Pick what you like. 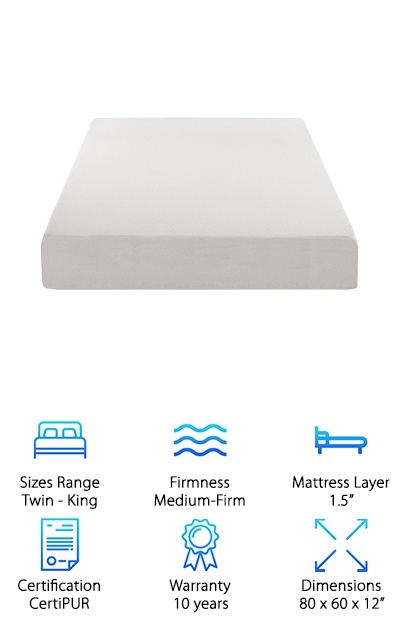 Mattress Layer - These mattresses all have multiple layers, but in our reviews, we’re referring to the top layer. 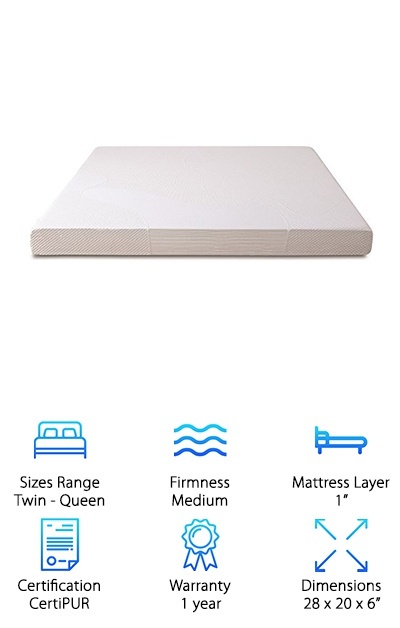 It’s usually memory foam but can be swapped with different varieties, too. Generally, the thicker, the better. Certification - The big thing to look for here is to make sure it’s CertiPUR certified. This means the mattress is made without ozone depleters, certain flame retardants, mercury, lead, or formaldehyde. Every mattress is independently evaluated to get this certification. Warranty - Most Zinus mattresses have a warranty that covers manufacturer’s defects for 10 years. It doesn’t cover regular wear and tear, which makes sense. You’re going to be sleeping on this thing for a long time. It’s going to wear over time. 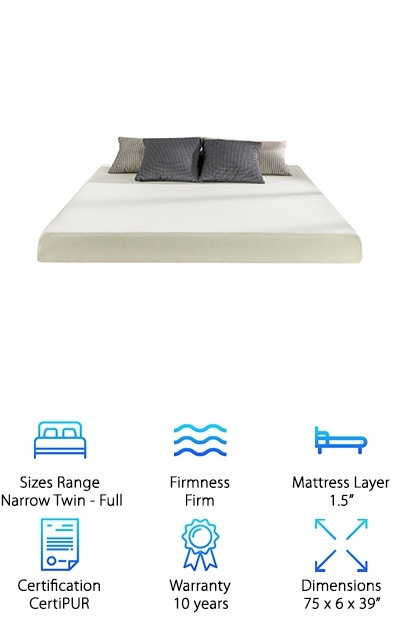 Dimensions - The dimensions vary depending on what mattress you choose. Remember, most sizes come in various thicknesses. You can find a queen that’s 6 or 12” high! Make sure you choose the right size for your bed frame. They say you spend a third of your life sleeping. Why shouldn’t you be as comfortable as possible? A Zinus mattress can help you get a refreshing night of sleep. Now that you know what to look for, our Zinus memory foam mattress reviews can help you find the right match for you. Check it out: if you’re in a hurry, take a look at our top and budget picks first. Now, let’s get started! For a memory foam mattress with that little extra something, check out this Zinus Green Tea mattress review. It has of two layers - a top layer of 1.5” of memory foam over thicker layer of high-density support foam. Memory foam might feel a little firm at first, but it softens as it conforms to your body. It becomes a mattress made just for you. That’s not all. The memory foam is infused with natural green tea. What does that mean? Your mattress will remain as fresh as it can because green tea is a natural odor fighter. Delivery is simple - it’s compressed, rolled, and mailed to your door in what seems like a surprisingly small box. After you open the box, watching the mattress unfold is part of the fun. For something with a little more support than a regular memory foam mattress, consider this hybrid. You get a 1.5” layer of combined support foam and green tea and castor natural seed oil infused memory foam over tradition coils. Hybrids truly give you the best of both worlds - the body hugging comfort of memory foam with the firm support of standard coils. Plus, the green tea and castor seed oil help fight odor and bacteria. That’s not all. It can be conveniently shipped to your door in a surprisingly small package. Because of the coils, this hybrid will spring to life a little faster than a foam mattress. Another great thing? No need for a box spring with this mattress, either! This is an extra special memory foam mattress. Of course, it’s from Zinus so it’s green tea infused to odor control. It’s also infused with all natural active charcoal, a really effective way to absorb moisture. What else is special about it? It’s gel infused and made with natural plant oil to eliminate some of the synthetic components. The top layer is actually 2” of gel infused memory foam. It gives your body the exact support it needs plus you get the cooling action of the gel. If you’re someone who gets hot or sweats a lot at night, give this get mattress a try. The cooling properties of the gel just might be what you need to get comfortable. Plus, it’s a great mattress to combat moisture and odor. Are you wishing for even more memory foam? Of all the Zinus memory foam green tea mattress reviews, pay attention to this one. 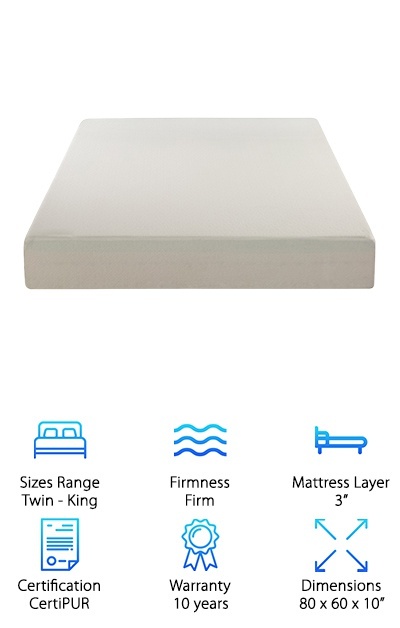 The top layer on this Ultima Comfort Memory Foam mattress is a whopping 3” of memory foam. It’s actually their newest memory foam innovation, BioFoam. BioFoam replaces some of the traditional petroleum used in making traditional foam with plant oils. This helps keep your mattress smelling a little fresher instead of having that slight chemical smell. Under the memory foam, you actually get 2 more layers - one of pressure relieving comfort foam and a bottom layer of support foam. What does that mean? Firm support for you and a durable mattress that will tolerate years of use. If you’re looking for a supportive, firm mattress, look no further than this one. While this mattress is only available in smaller sizes, that’s actually one of the things that’s so great about it. It’s a perfect mattress for kids. Whether you’re getting your little one’s first big kid bed or trying to find the perfect mattress for your sixth grader, this mattress is ideal. Truth be told, it’s actually the perfect thickness for bunk beds because it’s not so thick that it blocks the safety rails. It’s also made of the same high quality memory foam that Zinus is known for. It includes their BioFoam technology, which is great because your kids won’t be smelling as much of that chemical smell. Plus, it comes complete with green tea and active charcoal infusions. Because, let’s face it, if anyone needs a mattress with odor control, it’s kids. This mattress takes the best things about every other kind of mattress and puts it together into one comfortable package. Let’s break it down, top to bottom. First, it has a comfort foam layer and then a gel-infused memory foam layer. The gel keeps moisture away and helps regulate the temperature by dispersing your body heat. If you always get hot at night, a gel mattress could be just what you need to cool you down. Then, there are actually another 1.5” of foam. Then there’s the part that makes this a hybrid: 7.25” of iCoil pocketed springs. Hybrids tend to be a little softer than full foam mattresses so if you’re looking for all the perks of memory foam without the firmness, a hybrid might be the answer. There is a lot of foam in this mattress. Perhaps that’s why it’s so comfortable that it’s clinically proven to help you fall asleep faster and sleep better. Here’s how it works Basically, it’s all about the layers. Specifically, the sleep cool layering system. It consists of layers of MyGel Memory Foam, Memory Foam, Pressure Relief Foam, and a HIgh Density Foam base. Think about it. You get cooling gel infused memory foam and standard memory foam for support that conforms to your body. Plus, extra support for all your pressure points with ventilated Pressure Relief Foam. Plus, you get Zinus’s green tea and active carbon infusions and BioFoam, all of which will help with odors. How can this mattress not help you sleep better? Have you ever been sleeping on a floor or in a tent and thought, gee, you know what would be great right now? A memory foam mattress. Well, now you can have just that. 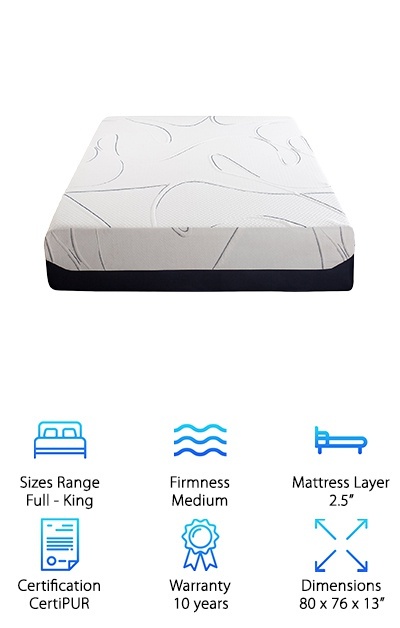 This is a foldable, portable twin sized mattress that provides a lot of comfort. Say goodbye to your air mattress! This one provides much more support without having to inflate anything. It has 4 solid inches of foam - 1 inch of memory foam, 2 inches of Viscolatex Responsive Foam, and a 1 inch high-density support foam base. Here’s the kicker: it’s the same foam used in full size Zinus mattresses. BioFoam infused with green tea and active charcoal to control odor and moisture. This becomes an even more important feature when you consider that this mattress can go literally anywhere. If you’ve ever slept on a sleeper sofa, you know that they’re less than comfortable. In fact, you may have wondered if it might be more comfortable to sleep on the floor. Do your house guests a favor and replace your current sleeper sofa mattress with this one from Zinus. 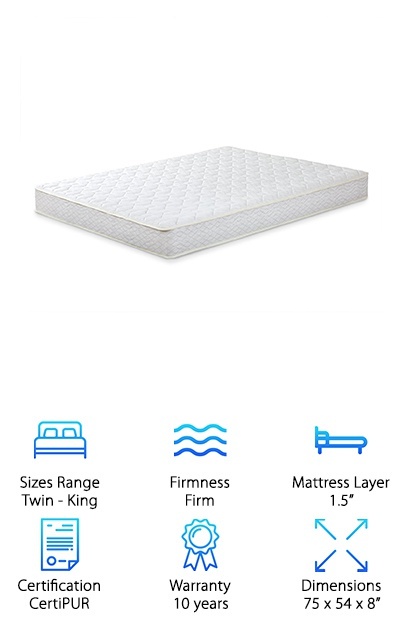 The top layer consists of premium gel-infused memory foam so whether it’s you or a guest sleeping on the pullout bed, there’s a good night’s sleep ahead. 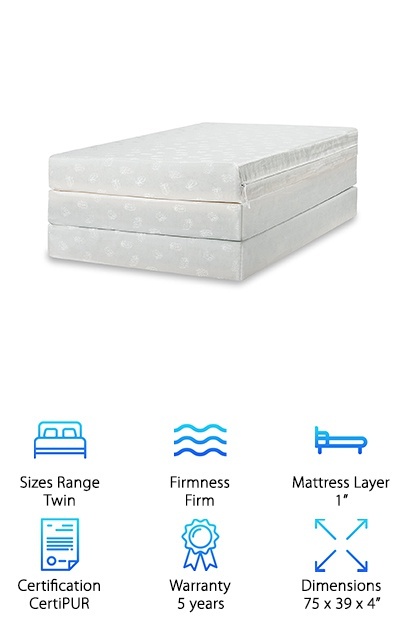 The memory foam is supportive enough that even side sleepers will love it. And the gel? Disperses body heat to keep you cool and comfortable. 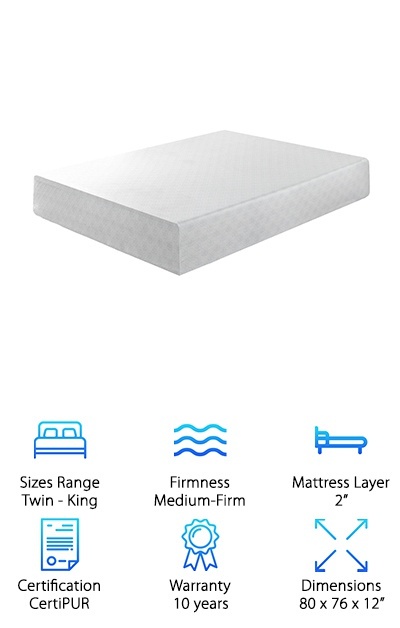 This is made with the same foam as all Zinus mattresses - BioFoam with natural green tea extract and active charcoal to absorb moisture and eliminate odors. This is a straightforward Zinus memory foam review but that doesn’t mean it isn’t awesome. 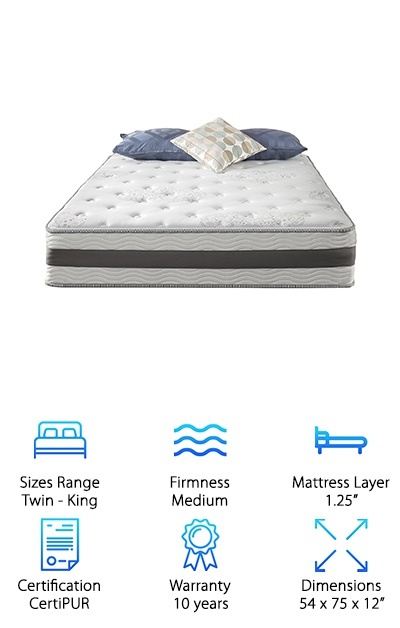 It has a top layer of premium high density memory foam on top of a layer of standard memory foam. Both include the green tea infusion, active charcoal, and BioFoam technology that Zinus includes standard in all of their memory foam. BioFoam truly is one of the most advanced ways to keep odor under control and help keep your mattress smelling fresh. The foam base layer gives you the right amount of support for a good night’s sleep. One last thing. Just like all Zinus mattresses, it’s shipped using their patented technology. The mattress is compressed, rolled, boxed, then shipped right to your door. It takes about 48 hours to return to its original shape.